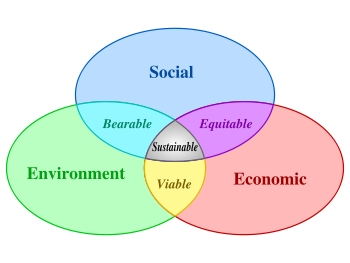 In the last post of this series – A brief background on Sustainability Issues, I tried to outline the various streams of thought flowing about the issue of Sustainability, specifically through the notion of Sustainable Development . I also touched upon a few metrics/indices surrounding sustainable development and linked to a number of reports from a select group of multinational firms as well. which is a great idea until one realizes that we don’t know what the needs of the future generations are – not in any specific sense anyway. Perhaps, we can hazard a guess about some vital ingredients of life no matter what form, where and when. Suppose we were to cut down drastically on the use of crude oil so that future generations have access to it – What use will crude oil be to a future generation that have technologies that do not even use crude oil in any form to generate power or harness mobility needs? The crucial (unstated) assumption in the above summary is technological stasis which is an idea that shouldn’t be sustained. In fact, it points to a deeper issue with the very language of sustainable development – that most proponents of sustainability miss out on the fundamental nature of technology (and its abstraction which is human creativity). I think that it is a necessary first step to outline the scope of what Sustainability entails. Before I begin this first rough cut exploration, let me reiterate the context of this post i.e. the first blog carnival of 2008 hosted at Sourcing Innovation by Michael Lamoureux. To that end, I reiterate my solicitation from you my readers toward contributions, comments, disagreement (mild or vehement), skepticism et al. This definition of Sustainable development owes its elucidation to the Brundtland Report (Brundtland Commission, formally the World Commission on Environment and Development (WCED), known by the name of its Chair Gro Harlem Brundtland, convened by the United Nations in 1983). Here is a graphic that succinctly describes the UN’s hopes concerning sustainable development. I used the word "hopes" quite deliberately because that is the reality of it. Sustainable Development is an ambiguous concept, as a wide array of views fall under its umbrella. The concept has included notions of weak sustainability, strong sustainability and deep ecology. Different conceptions also reveal a strong tension between ecocentrism and anthropocentrism. Thus, the concept remains weakly defined and contains a large amount of debate as to its precise definition. During the last ten years, different organizations have tried to measure and monitor the proximity to what they consider sustainability by implementing what has been called sustainability metric and indices. degradation by physical means and, in that society. . .
3. Life Cycle Assessment – The resultant is a composite measure of sustainability. It analyses the environmental performance of products and services through all phases of their life cycle: extracting and processing raw materials; manufacturing, transportation and distribution; use, re-use,maintenance; recycling, and final disposal. the quantity of energy required to manufacture, and supply to the point of use, a product, material or service. Emergy Yield Ratio is Emergy of an output divided by Emergy of all inputs and Environmental Loading Ratio is purchased and nonrenewable indigenous emergy to free (or renewable) environmental emergy. 5. The World Business Council for Sustainable Development approach – Lastly, since everyone has so far been talking about how to let businesses run, how long would it be before businesses themselves got into the act. Throughout the economy there are widespread untapped potential resource productivity improvements to be made to be coupled with effective design. There has been a significant shift in understanding over the last three decades of what creates lasting competitiveness of a firm. There is now a critical mass of enabling technologies in eco-innovations that make integrated approaches to sustainable development economically viable.